See our Benro shop for full range of Benro products. The Benro Magnesium Aluminium A268M8 Travel Angel Tripod Legs are a sophisticated tripod made for those who want to do some macro shooting with the camera facing directly at the ground, or perhaps even pointing under the legs themselves. Beyond this function, it's a solid 4-section 'flip lock' aluminum model with enough creature comforts to make vacations a little more pleasant with the tripod. The A268M8 Travel Angel Tripod 24mm diameter upper leg segments provide rigidity necessary for full-sized SLRs with somewhat larger telephotos, and you'll also get a 'working height' of 60", a height that leaves the viewfinder high enough that you won't hurt your back even with the column fully collapsed. The tripod's officially rated to support 26.5 lbs, and Benro recommends it for SLRs with lenses of up to 200mm focal length. The A268M8 Travel Angel Tripod flip-lever leg locks are of the newest technology, and provide reliable and fast use with just a small motion necessary. 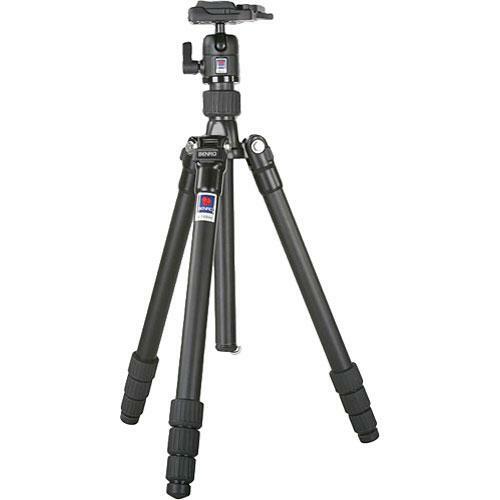 For more information about, Benro Magnesium Aluminium A268M8 Travel Angel Tripod (BH1 Head) website.